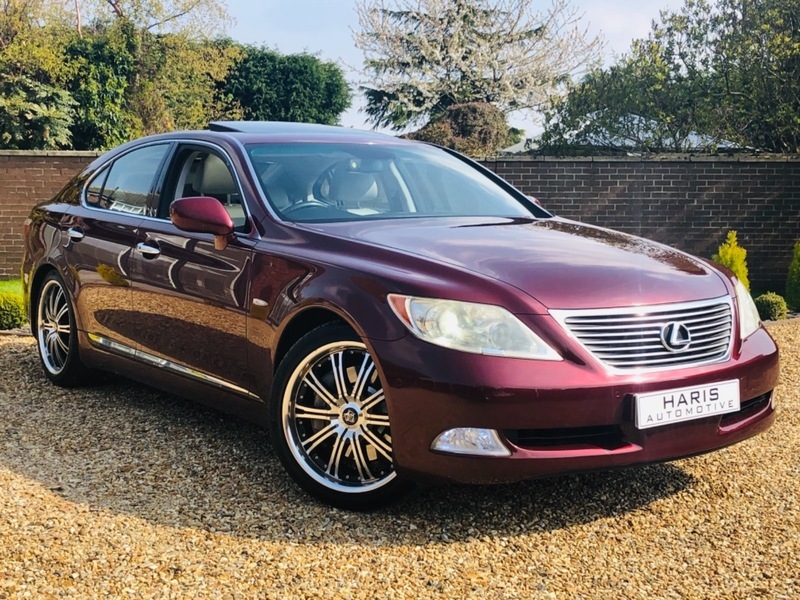 HERE AT HARIS AUTOMOTIVE WE ARE PLEASED TO OFFER THIS TRULY EXCEPTIONAL LS460 375bhp SALOON WHICH I MUST ADMIT IS THE HIGHEST SPEC'D LEXUS WE HAVE HAD THE PLEASURE OF OWNING!! +++ MASSIVE SPEC +++ FULL GREY LEATHER HEATED & COOL ELECTRIC FRONT AND REAR SEATS RSR PACK (Rear Seat Relaxation) + REAR ENTERTAINMENT WITH ROOF MOUNTED ELECTRIC RETRACTABLE DVD SCREEN WITH REMOTE AND HEAD PHONES + SOFT CLOSURE DOORS + KEYLESS ENTRY + KEYLESS STOP/START + 20" WOLF RACE ALLOY WHEELS + REAR ELECTRIC RECLING SEATS + REVERSE CAMERA WITH LEXUS PARK ASSIST + TILT/SLIDE ELECTRIC GLASS SUNROOF + TOUCH SCREEN SATELLITE NAVIGATION + REAR ELECTRIC PRIVACY BLINDS WHICH CAN BE CONTROLLED FROM THE FRONT AND REAR + CRUISE CONTROL + ONBOARD COMPUTER + CLIMATE CONTROL + SPORT/COMFORT DAMPER SETTINGS + FRONT AND REAR ELECTRIC WINDOWS + ELECTRIC POWER FOLDING MIRRORS + AUTO HEADLIGHTS + DRIVER CENTRE LEATHER ARMREST + ISOFIX POINTS + CD PLAYER + LEATHER MULTI FUNCTIONAL STEERING WHEEL WITH ELECTRIC ADJUSTABLE STEERING COLUMN + MASSIVE SPEC TOO MUCH TO LIST!! MUST BE SEEN TO REALLY APPRECIATE! !